Tarsal coalition is a relatively common abnormality, in which a connection develops between two bones in the back of the foot (the tarsal bones). This abnormal connection, which can be composed of bone, cartilage, or fibrous tissue, may lead to limited motion and pain in one or both feet. Tarsal coalition is caused either by a congenital failure for the tarsal bones to properly segment, or it may also be seen as a secondary problem due to progressive arthritis, immune diseases such as rheumatoid arthritis, or it may also be seen as a result of repetitive trauma. 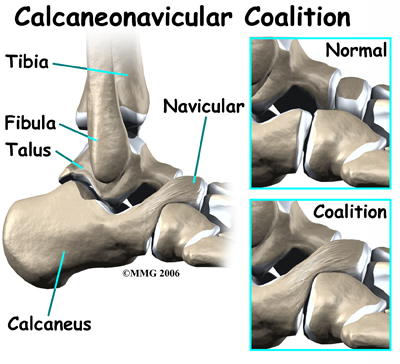 The fusion is most common between the calcaneus-navicular bones and the talus-calcaneus bones. This joint is also known as the subtalar joint, and allows the foot to articulate inward or outward. There are three types of fusions. The first is a bony fusion which is bone to bone fusion and tends to be the most rigid type of fusion. Next, is a cartilage to cartilage fusion and last is a fusion of two bones through a fibrous union which is similar to scar tissue. These fusions either restrict or completely eliminate normal joint motion which generally forces the foot into a rigid flatfoot. This fusion of bone will ultimately adversely affect adjacent joints eventually leading to arthritis of those joints. Diagnosis is generally made through clinical examination and is confirmed through x-rays, CT scans, or MRI studies. Oral anti-inflammatory medication in an effort to reduce inflammation in the rear foot. Physical therapy to reduce inflammation and perhaps improve motion. Cortisone injections may also help reduce inflammation. Orthotics in an effort to reduce motion in the affected joint and keep the foot in a more neutral position. Immobilization through the use of a cast in an effort to reduce inflammation through rest and also to reduce any muscle spasm that may be present. Injection of local anesthesia in an effort to relax muscle spasm, usually performed prior to casting. If it cannot be addressed with conservative physical medicine modalities, then preventing further degeneration of the subtalar joint is possible using platelet-rich plasma (PRP) and stem cell therapy. Platelet-rich plasma (PRP) and stem cell therapy release growth factors and may help to regenerate tissues to prevent further degeneration. If you suffer with tarsal coalition and your current treatment plan leaves you feeling hopeless, perhaps a fresh set of experienced eyes can change your outlook. Since 1990, Dennis M. Lox, M.D has applied his personal interests in sports medicine, cutting-edge regenerative medicine and chronic pain management to helping patients increase their quality of life. Contact us for an appointment at 727-462-5582.